With players back at Palmeiras after two weeks of holidays, Argentine Ricardo Gareca has officially been installed and is now exercising his coaching duties. Things have been going smooth these first couple of days, with a focus on low-intensity muscular training and the carrying out of some physical evaluations. Gareca is addressing all players by their names and the language barrier has apparently not been an issue. Defensive midfielder Tinga is not in the group commanded by Gareca: on loan at different clubs since 2012 – the last one being Avaí – Palmeiras has negotiated the players’ economic rights with Japanese club Jubilo Iwata, putting an end to Tinga’s four-year spell at Palmeiras. Attending a request from Gareca, Palmeiras have promoted four players from the youth academy that will train with the first squad: defenders Léo Cunha and Mateus Müller, midfielder Juninho and striker Erik. 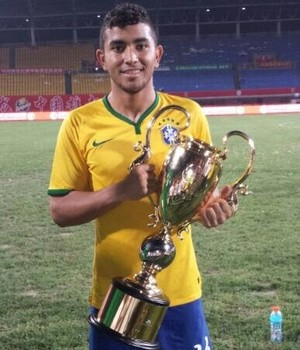 These are all good names: Müller (pictured on your right) was on the Brazilian under 20 national squad that won the international “Panda” Cup. The group of four will join the rest of the squad this coming Monday, for the training period in the city of Atibaia, interior of the state of São Paulo. Gareca is known for keeping a close eye on the youth academy. Palmeiras also continue scanning the transfer market for reinforcements. Argentine centre-back Fernando Tobio is said to have reached a verbal agreement with Palmeiras and is expected to sign a five-year contract in July. Forwards are also a priority, with former Boca Juniors striker Pablo Mouche reportedly close to signing. Both these players are on Gareca’s wish list; an invasion of hermanos, it seems. At the moment of writing, David is doing rather well against Goliath, Australia putting pressure on the Dutch and sustaining a 1-1 draw in group B. At 7pm local time, the last game of the day features Cameroon and Croatia, both teams looking to bounce back from their initial defeat in Group A, where Brazil and Mexico sum four points each after yesterday’s goalless draw. It’s however the game in the middle, at 4pm, that attracts the most attention: Chile take on current World Champions Spain, the latter desperately needing the three points after having lost in the opening round to van Persie, Robben and Co. At William Hill world cup betting, Chile is the natural underdog at 5 to 1, but if Palmeiras’ playmaker Valdivia finds the space for those precise cut-through passes while counter-attacking, the Spaniards might be in for an unpleasant surprise.